As you can read in About Billiard, my formal training was in Physics and Astronomy. But somewhere along the way I discovered a need to do something with my life other than “living to make a living”. While there is nothing wrong with working at a regular job, if that is your calling in life, I found that I had a call to do something else. Working with SIL turned out to be the way that I could take my technical skills and apply them to something that I knew was important. I officially joined in 1990 and never looked back. The way we do things has changed considerably over the years, but the goal remains the same. And that is what is important to me. For more about these two organizations, see the accompanying page on Wycliffe and SIL. In the summer of 1988 I asked a question that eventually led to my becoming a member of Wycliffe Bible Translators. As stated above, I had been looking for something more meaningful to do with my life, and this was where God led me. After being accepted with the organization, they sent me to take two semesters of linguistics with SIL International, the first in North Dakota and the second in Dallas. Afterward, I received orientation at the JAARS center in North Carolina. You can read the historical details of this period in my life in About Billiard. In the fall of 1990, after the orientation course at JAARS, I was invited to become a member of SIL Brazil. I arrived in the country for the first time in early 1992 and spent most of that year in Campinas, studying Portuguese, which is the national language (see About Brazil). During that year, I also received a brief orientation to the work of SIL Brazil, and after finishing language school I was considered ready to be a part of the team. For more details about my history here in Brazil, see the section on Life in Brazil on the About Billiard page. As a member of SIL Brazil, my work contributes the greater overall task of linguistics, literacy and Bible translation among the various people groups of this great country. But what exactly is it that I do? Do I live out in a village? Have I learned an indigenous language? Do I eat grubs and tubers? How do I get to work? In most SIL entities, the membership is roughly equally divided between actual linguist/translators and those who provide support services. Support services include jobs in administration, accounting, audio-visual, aircraft piloting, government relations, computer technical services, graphic design, plus whatever else needs doing. This was not always the case. In early years, translators would be pulled away from their projects for a period of time to do these jobs. Eventually, the organization recognized the need for members with skills specifically dedicated to these types of jobs, and began recruiting support workers who were not linguists. Therefore, to answer the above questions, no, I have not learned an indigenous language. As I stated previously, I have learned Portuguese, since it is the national language. Neither to I eat grubs; I shop in a grocery store and eat essentially the same type of food as I do in the States. And I usually get to work either by walking or riding my bicycle. So why did I choose this particular type of work? Well, for starters, I recommend you read Billiard and Computers to find out more about my history and connection with information technology in general. Beyond that, it was an area where I saw a need and sensed God calling me to use the skills He had given me in order to help accomplish something I believe is truly worth accomplishing. When SIL began its work, the few computers that existed were monstrous constructs of coils and vacuum tubes that filled entire buildings. And their computing power was on a par with a modern programmable calculator. The concept of “software” was still years in the future, as were disk drives and other portable storage devices. SIL translators went to the field armed with notebooks, sheafs of 3 x 5 cards, and their brains. Today, translators still have their brains, fortunately. No human work will ever be possible without the power of human thought. But the tools have advanced tremendously. Now, linguists go to the field armed with the latest notebook computer, loaded with the latest linguistic software, and with a vast array of reference material available by means of a few mouse clicks. Fieldworks Language Explorer (FLEx) is an extremely powerful analysis tool which can be used to create bilingual dictionaries, do grammatical analyses, interlinearize texts, etc. 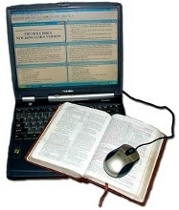 Programs such as ParaTExt allow the user to translate scripture, and at the same time perform consistency checks, chapter-verse checks, and much more. Keyboard layout creators allow users to type in just about any language whose alphabetical characters exist in the Unicode standard. Desktop publishers let ordinary users produce quality educational material. And more is on the way. Communications have also moved into the 21st century. The Internet has gone into every corner of the world. And in places where there is no local service, people can still access the 'Net via satellite. This allows rapid communication not only with fellow workers, but with family and friends back in the home countries. Questions can be answered without having to wait for weeks. News is quickly available. Downloads bring the latest software within easy reach. Data can be exchanged with fellow workers quickly and easily. So what do we gain by all this new technology? Speed? To a degree, yes. Automation allows users to quickly lay out documents, assemble language data for analysis, search and replace text and more. But the greatest gains have been in the areas of accuracy and quality. Computers do not “get tired” and miss things. The use of styles in formatting ensures that all parts of a given publication will be consistent in layout and appearance. Modern laser printers work at very high resolution. And the power of the programs mentioned a couple of paragraphs above eliminate many mistakes that went undetected in the days when everything was done by hand and eye. And in addition to facilitating linguistic and translation work, modern computers and software are vital in administrative and other support tasks. These jobs do not tend to use the specialized linguistic software that the language teams use, but many common commercial applications are just as useful to SIL as they are to any other entity, public or private. My job is essentially to use all of the tools and such described in the previous section and apply them—along with anything and everything related that might be needed—to help facilitate the work of linguist/translators and support personnel for SIL Brazil and our partner organizations here in the country. In the past, when I first arrived, SIL Brazil was much larger, and we had 3-4 members all doing the same job. Over the years, however, as you can read in Wycliffe and SIL, our membership declined as people retired and the way we do things changed. Today, I am the only computer support member left. To find out where I am currently based out of and working, visit the page on Current Billiard. So, what does computer support work involve? The answer to that has changed over the years. As stated above, modern software allows ordinary working linguist/translators to do many things today that most of them could not do during my first years in Brazil. In those years, I did a lot of desktop publishing to produce literacy and other reading material for various teams. Email was limited and we used a “General Delivery” box for everyone, and I downloaded messages every day, printed them out and distributed them. Translators needing their texts checked for errors and consistency came to me, and I would use a series of DOS-based command line tools (somewhat simplified by batch scripts) to perform the checks. Many did not have their own computers, so I maintained a couple of public machines for people to use. Over the years that has changed. Software improved, and instead of doing people's layout for them, I began showing them how to use the programs instead. Then the programs became so intuitive that I no longer even needed to teach most people. Everyone acquired their own email address, and we did away with General Delivery and our local post office computers, even more so as Internet speed vastly increased. Individual computers in each office gave way to networking, with a central file server, and eventually a central Internet gateway. We set up our own web site. And another thing that has not changed over the years—and probably never will—is the necessity to sit down one-on-one with people who simply want help with a problem. And what about the future? The only thing I can be certain of is that it will be different. Exactly how different remains to be seen. There are still many needs. And as long as God makes it possible, I will be here to help meet them. So, does my life consist of computers and nothing else? By no means! I would be a rare SIL member indeed if I didn't have anything else to do except for my specialty. Indeed, many of our members no longer work in the original specialty for which they came to the field. Pilots become directors and translators. Translators become accountants. And so forth. Yes, my main assigned work is still computer support. But I do other things. For example, telephone system maintenance has fallen into my lap, especially with the increasing use of VoIP systems, which are directly computer-based. And since we no longer have an electronics technician, it has fallen to me to maintain things such as the sound system that we use occasionally for meetings and for Conference, or remote controls for electronic security gates. Almost any little technical issue that arises, someone will come to me to see if I can figure out what to do. A lot of times, I can. And who can tell what the future will bring? New “toys” are constantly being invented, and many find their way into our hands for our members to use. And when they do, I'm sure that trying to figure them out and fix them will probably land in my lap. You may have finished reading everything above and be sitting there thinking, “Gee, that's really great! But how can you get it done? What do you live on? Do you have another job that pays the rent and puts food on the table? The answer to that is, “No”. Wycliffe Bible Translators operates on the principle that the Body of Christ (the Church) has many members, each with its own function. While most members work at ordinary jobs as part of their function, some of us are called to dedicate ourselves full time to certain tasks that do not allow us to work at ordinary jobs to meet our daily needs. At the same time, God raises up other members of the Body to donate a percentage of their work income to make it possible for those dedicated to full-time service to be able to do their jobs. In order to also meet operating costs, as well as meet numerous legal requirements (for legal purposes we are considered employees of Wycliffe), the organization sets a minimum quota of financial support, averaged over a year, that each of us must receive per month. Members are not allowed to leave their home countries to go to their field of service unless they are receiving 100% of their established quota, unless the field entity specifically makes an exception. This quota includes necessary amounts to cover monthly deductions for retirement savings, income tax, health insurance, etc., as well as living expenses. In addition, ten percent goes to help meet Wycliffe and SIL operating costs. To see what my current status is with respect to this quota, please see the section on Support Level on the Current Billiard page. Also, I want to emphasize that financial support is only part of the picture. For a more complete overview of what is needed to accomplish this vital task for the Kingdom of God, please read the Three-Fold Challenge. And afterward, ask God if He might be speaking to you.